Hamid Dabashi. 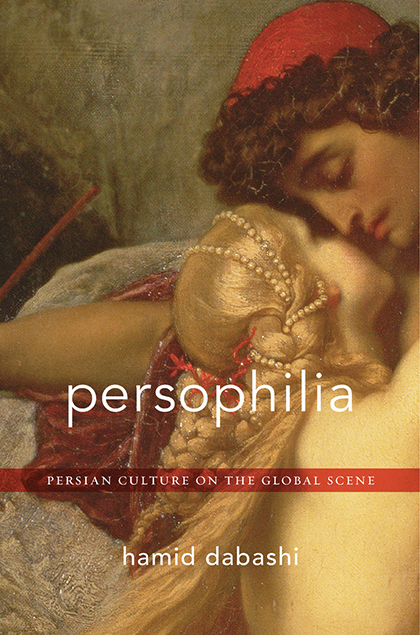 Persophilia: Persian Culture on the Global Scene. Cambridge, Mass. : Harvard University Press, 2015. 296 pp. In Persophilia, Hamid Dabashi explores the consequences of the European fascination with all things Persian, examining texts by Montesquieu, Voltaire, Johann Wolfgang von Goethe, and Friedrich Nietzsche; artwork by Paul Gauguin and Henri Matisse; the scholarship of E. G. Browne and Annemarie Schimmel; and even the films of Abbas Kiarostami. Dabashi narrates a dynamic process whereby Persian culture travels outside of its imperial courts, becomes the idée fixe of European artists and intellectuals, and returns from Europe utterly transformed by its cross-cultural and colonial encounters. In recovering this lively but largely unacknowledged artistic and critical circuit of exchange—which begins in seventeenth-century Europe, becomes prominent in the eighteenth and nineteenth century, and continues into the present—Dabashi models a vein of cross-cultural comparison that scholars of all disciplines should heed. Dabashi investigates the effects of European (and later American) persophilia through an engagement with Edward W. Said, Raymond Schwab, and Jürgen Habermas. Said and Schwab offer causal explanations for Europe’s interest in the so-called Orient. For Said, Europe created knowledge about the “Orient” in order to dominate and colonize it; for Schwab, European artists viewed the “Orient” as an imaginative or artistic substrate. But for Dabashi, “abandoned in both their projects is the fate of the Orientalized societies themselves—or what happens to Persian, Indian, Arabic, or Chinese literary and artistic traditions (and the emerging public spaces that are hosting them) once they have been translated into a European context” (p. 9). To correct this lack, Dabashi turns to Habermas, whose concept of the public sphere allows Dabashi to provide an account of the effects of persophilia that is neither cultural (Schwab) nor political (Said) but social. This social or societal account of persophilia obviates two biases that tend to dominate critical thought about the postcolonial state: the critique of European Orientalism (which, for Dabashi, “paradoxically assigns universal agency to a Eurocentric conception of the world”) and a radical anti-Western nationalism (p. 206). Although “both sides of this binary—the critique of Orientalism and the appeal of nativism—are both necessary and even logical for the historical circumstances in which they were launched,” Dabashi writes, “at the same time they have both come together paradoxically to rob the postcolonial person of historical agency and moral and authorial imagination” (p. 206). Dabashi’s attempt at restoring agency and imagination to the “postcolonial person” rests on the following claims about the cycle of European persophilia: Persian culture exited its royal courts and entered the emerging European bourgeois public sphere through art, literature, and philology, largely in the eighteenth and nineteenth centuries; this European bourgeois public sphere became transnational in light of this encounter with Persia (and other cultures); this newly transnational public sphere periodically reentered Persia through the circulation of eighteenth- and nineteenth-century texts and through the twentieth-century colonial encounter; and finally, the appropriation of the transnational public sphere by twentieth-century Persians provided them with the tools to resist European imperialism. With each stage of persophilia—from Persia, to Europe, and back—Dabashi underscores the fact that the ideas and texts being exchanged underwent mutations. Dabashi’s argument unfolds over twelve brief chapters, each of which describes a cycle of persophilia organized around one or two literary or scholarly figures. In chapter two, for example, he describes the windy path of Montesquieu’s Persian Letters (1721), which was inspired by the travels of two Frenchmen to Isfahan in the seventeenth century. Persian Letters of course reverses that voyage, and describes, in epistolary fashion, the satirical observations of two Persians in France; Dabashi’s gloss of Persian Letters allows him to claim that European persophilia was at the heart of the European Enlightenment. In support of Persophilia’s overall argument about cultural flows, Dabashi then demonstrates how Montesquieu’s persophilia came to influence Persian writers themselves. Accordingly, Dabashi zooms in on one Persian intellectual, Mirza Fath Ali Akhondzadeh (1812–1878), who wrote his own epistolary work, the Correspondences of Kamal al-Dowleh (Maktubat-e Kamal al-Dowleh; 1863), after being exposed to the ideas of Montesquieu as well as those of Voltaire and Jean-Jacques Rousseau. Akhondzadeh was a prolific dramatist and essayist whose writings often transliterated words such as “civilization” and “despotism” directly into Persian—“a clear indication,” for Dabashi, that these concepts “entered Persian prose directly under the influence of Montesquieu and other French Enlightenment thinkers” (p. 56). Throughout his wide-ranging career, Akhondzadeh also launched a campaign to latinize the Persian alphabet and debated the merits of liberal democracy. In short, his intellectual production, originally inspired by persophilic European thinkers such as Montesquieu, helped open a public sphere in Persia—a prime example of how Persian culture drifted into Europe and returned to Persia to catalytic effect. Chapter four, entitled “Goethe, Hegel, Hafez, and Company,” is similarly exemplary of Dabashi’s argument. Here he describes how Goethe’s fascination with Hafez and Saadi Shirazi, newly translated into German during his lifetime, led to the publication of the West-östlicher Divan in 1819. Likewise, for G. W. F. Hegel, these translations created an image of Persia against which he could define European thought in his philosophy of world history. For many German romantic thinkers of the early nineteenth century, classical Persian poetry—with its strains of self-annihilation and rebirth—fed into a form of nationalist mysticism that would ultimately provide cover for the political repression of liberal thought. Romantic beliefs proliferating in nineteenth-century Germany, influenced by their appropriation of Persian and “Sufi” poetic mysticism, had “a joint proclivity toward political absolutism” that reentered Persia in the twentieth century through the thought of Seyyed Hossein Nasr (p. 100). Under the sway of the Swiss-German mystic Frithjof Schuon, Nasr would launch a critique of modernity that “had a direct root in these German sources of romanticism, mysticism, and fascism” (p. 101). Nasr’s antimodern ideology would provide cover for both the Pahlavi dynasty and its destroyer, Ayatollah Khomeini. The chapters I have sketched above are emblematic of Dabashi’s method in this book, which regularly marshals substantial and engaging evidence to support his cyclical theory of persophilia. Persophilia’s main shortcoming has to do with the last movement of its argument, which asserts that the public sphere in Persia was not restricted to the bourgeoisie and in fact admitted subaltern classes; this claim, while prominent in the introduction, is mentioned only en passant in most chapters, and does not receive the same space and explanatory treatment enjoyed by the work’s other major ideas. In some ways the counterpart to Dabashi’s previous book—The World of Persian Literary Humanism (2012), which narrated the various stages of Persian literature’s understanding of itself in a fashion reminiscent of Hayden White’s Metahistory (1973)—Persophilia joins a wave of scholarship that sheds light on the global origins of phenomena typically considered the province of specific national traditions. Furthermore, it generates new ways of thinking about global culture that do away with tired dichotomies such as East and West, center and periphery, and tradition and modernity. What makes Persophilia an especially urgent and impressive accomplishment is that Dabashi achieves all this without advocating for parity or equivalence and without ignoring the asymmetrical power relations that underlie all encounters between cultures.